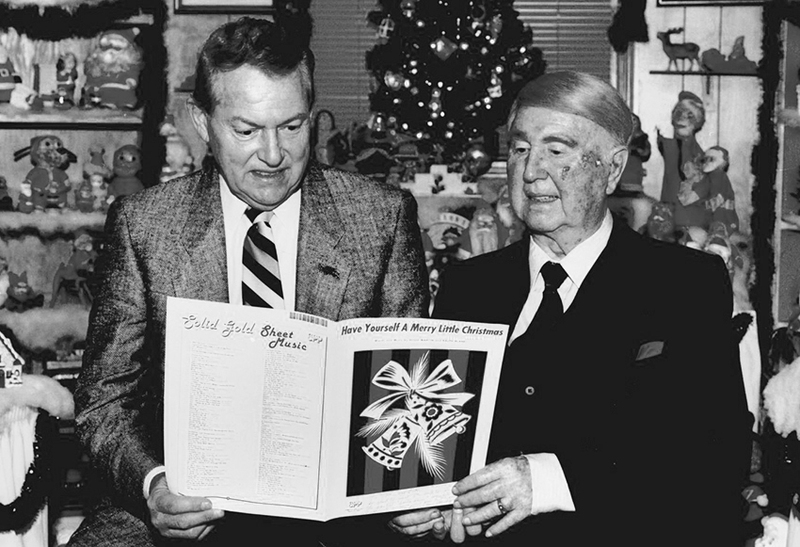 Ralph Blane (right) with his song "Have Yourself a Merry Little Christmas"
(2012.201.B0093.0309, Oklahoma Publishing Company Photography Collection, OHS). Oklahoma-born composer Ralph Blane entered the world as Ralph Uriah Hunsecker on July 26, 1914, in Broken Arrow. Son of Tracy M. and Florence Wilborn Hunsecker, he attended school in Broken Arrow and at Tulsa Central High School. After attending Northwestern University, he studied music in New York City. At about this time he changed his name to Ralph Blane because it fit better on a theater marquee. Working as a singer and vocal arranger in New York, Ralph Blane teamed with Harry Warren and then with Hugh Martin. Blane and Warren wrote the football tune "Buckle Down, Winsocki." Martin and Blane teamed for fifty years and also collaborated with Irving Berlin, Cole Porter, and Richard Rodgers. Blane's Hollywood movie musical credits include My Dream Is Yours (Doris Day, 1949) and The Girl Most Likely (Jane Powell, 1957). Martin and Blane's most memorable score was for Meet Me In St. Louis (1944), starring Judy Garland. The film's tunes included "Meet Me In St. Louis," "Have Yourself a Merry Little Christmas," and "The Trolley Song" ("'Clang, clang, clang' went the trolley, 'ding, ding, ding,' went the bell"), which garnered an Academy Award nomination. In 1979 Martin and Blane wrote the score for Mickey Rooney's Broadway show Sugar Babies. In 1989 they re-scored Meet Me In St. Louis for Broadway, earning four Tony nominations, one for Best Adapted Score for a Musical. Blane's last work came as lyricist for the music in Home Alone in 1990. Ralph Blane married Emajo Stage in 1947; the couple had one son. Blane retired to Broken Arrow in the 1990s and died on November 13, 1995. At the time of his death, the American Society of Composers, Authors and Publishers (ASCAP) registered more than five hundred songs in his name. "Biographical Sketch of Ralph Blane [Typescript, ca. 2000]," Bixby Historical Society, Bixby, Oklahoma. San Francisco Examiner, 14 November 1995. Tulsa (Oklahoma) World, 14 November 1995. Dianna Everett, "Blane, Ralph," The Encyclopedia of Oklahoma History and Culture, https://www.okhistory.org/publications/enc/entry.php?entry=BL011.